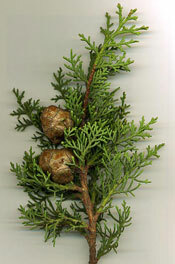 Cypress Essential Oil, Biblical Tree, Victorie Inc.
Our cypress essential oil has a clean, lively scent. (Heb. tirzah, "hardness"), mentioned only in Isaiah 44:14 (RSV, "holm tree"). The oldest Latin version translates this word by ilex, i.e., the evergreen oak, which may possibly have been the tree intended; but there is great probability that our Authorized Version is correct in rendering it "cypress." This tree grows abundantly on the mountains of Hermon. Its wood is hard and fragrant, and very durable. Its foliage is dark and gloomy. It is an evergreen (Cupressus sempervirens). "Throughout the East it is used as a funereal tree; and its dark, tall, waving plumes render it peculiarly appropriate among the tombs."